This article is about the Mawson Antarctic base. For other uses, see Mawson (disambiguation). Mawson was named in honour of Antarctic explorer Sir Douglas Mawson. Mawson was listed on the Register of the National Estate in 2001 and listed on the Commonwealth Heritage List on 22 June 2004, reflecting the post-World War Two revival of Australia's scientific research and territorial interests in Antarctica. .
Mawson Station is a base for scientific research programs including an underground cosmic ray detector, various long-term meteorological, aeronomy and geomagnetic studies, as well as ongoing conservation biology studies, in particular of nearby Auster rookery, a breeding ground for emperor penguins and Adélie penguins. Mawson Station houses approximately 20 personnel over winter and up to 60 in summer. It is the only Antarctic station to use wind generators for over 70% of its power needs, saving over 600,000 litres (130,000 imp gal; 160,000 US gal) of diesel fuel per year. It is accessible by sea for only a short period each austral summer, between February and March. Mawson's infrastructure includes an ANARESAT satellite antenna Earth station for communication. In 1946, the Minister for External Affairs, H.V. Evatt indicated his support for a proposal by Douglas Mawson for the establishment of a permanent Australian base in Antarctica. It was another seven years before a suitable ship, the Kista Dan could be chartered to set up facilities on the southern continent. The station site was chosen in 1953 by Dr. Phillip Law, first director of the AAD, who drew aerial photographs taken during the U.S. Operation Highjump (OpHjp) of 1946-1947 to select the site for its large natural harbour (Horseshoe Harbour) and permanently exposed rock for building. The station was built during 1954. Some of the small pre-fabricated huts used in the first years remain on the station, but these are overshadowed by large steel-framed modular buildings dating from a major rebuilding program which started in the late 1970s. In 2018, astronaut and academic Jay C. Buckey was part of research using virtual reality, at the Australian Antarctic Division’s Mawson Station, wherein the expeditioners used VR headsets to view Australian beach scenes, European nature scenes, and North American nature scenes of forests and urban environments, which were different from the isolation of the whiteness and silence of Antarctica. The research will inform psychological techniques to support long duration spaceflight such as for astronauts going to Mars. Mawson Station is located at Holme Bay in Mac Robertson Land, East Antarctica, named in January 1930 by Sir Douglas Mawson during the first British Australian and New Zealand Antarctic Research Expedition (BANZARE) voyage, aboard Discovery. It is in a region which Mawson proclaimed as British territory on several occasions in 1930 and 1931 (including at Proclamation Island, Scullin Monolith and Cape Bruce), and later became Australian Antarctic Territory. Some notable geographic features in the region include the Framnes Mountains, which form the dramatic backdrop to Mawson Station. The Framnes Mountains were named in the 1930s by Norwegian explorers financed by the shipowner and whaling magnate Lars Christensen. Further away, to the northwest, lie the Napier Mountains, which were first visited by an ANARE survey party from Mawson Station in 1960. The survey party was led by Syd Kirkby, and included Terence James Elkins. The highest peak of this small range is Mount Elkins, which was named after Terence James Elkins, ionospheric physicist with ANARE at Mawson Station in 1960. ^ "Living at Davis". Australian Antarctic Division. Department of the Environment, Australian Government. 6 November 2002. Retrieved 11 July 2016. ^ a b "Mawson station: a brief history". History of Australian Antarctic stations. Australian Antarctic Division. 12 August 2010. Retrieved 8 July 2016. ^ "Mawson Station, Mawson Station, EXT, Australia (Place ID 105444)". Australian Heritage Database. Department of the Environment. 22 June 2004. Retrieved 8 July 2016. ^ "Mawson science". Australian Antarctic Division. 21 August 2006. Retrieved 8 July 2016. ^ Yates, Peter (1 March 2006). "Wired for sound…and email…and video" (PDF). Australian Antarctic Magazine. Australian Antarctic Division (10): 10. Retrieved 26 April 2017. The first satellite earth-station, which includes a 7.3 m dish antenna, was installed and commissioned at Davis in March 1987. 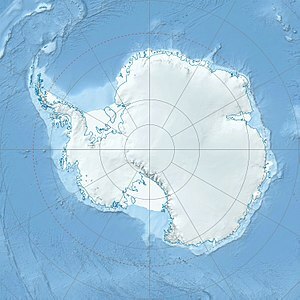 Mawson was commissioned in January 1988, Casey in March 1988, and Macquarie Island in December 1988. ^ a b Scott, Keith (1993). The Australian Geographic book of Antarctica. Terrey Hills, New South Wales: Australian Geographic. pp. 29–31. ISBN 1-86276-010-1. ^ "Monthly Climate Statistics for Mawson". Climate statistics for Australian locations. Bureau of Meteorology. Retrieved 13 November 2016. Bowden, Tim. The Silence Calling – Australians in Antarctica, 1947–97. Allen & Unwin. Wikimedia Commons has media related to Mawson Station. "Mawson Station Heritage Management Plan 2014 - 2019: Volume 1". Australian Antarctic Division, Department of the Environment. Australian Government. 2014. "Mawson Station Heritage Management Plan 2014 - 2019: Volume 2". Australian Antarctic Division, Department of the Environment. Australian Government. 2014.